To learn more about Table of Contents, check out this help center article. I'm writing this from the Phoenix Sky Harbor airport, just 5 minutes before I hop on a plane back to Google in California. I spent the day at Arizona State University (ASU), the second stop on our Apps to School bus tour of U.S. college campuses. Boy, it was hot outside today: 94 F (34 C). I really enjoyed talking to students about Google tools like Docs and introducing them to new Docs features like our template gallery and forms. Before I board, I wanted to point out another useful feature that we forgot to mention on yesterday's blog post: Table of Contents. 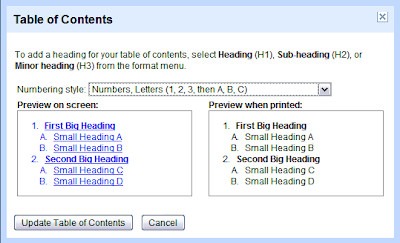 In the Format menu, you can use the following for section headings: Heading, Sub-heading and Minor heading. Then, insert a Table of Contents on the first page of your document.